One size. Can be expanded in length. Out of print. This pattern was available for $4.50. I was given an opportunity to knit a design for Jimmy Beans Wool Madelinetosh Toshstrology Collection for the month of March (Aries). 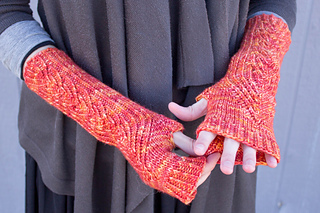 With one skein of Tosh Sport, I designed The Arietis Mitts (the name comes from a group of the most prominent stars in the Aries constellation). 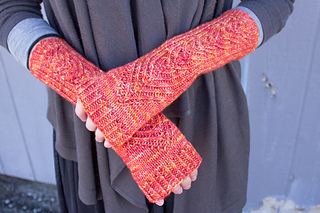 Twisted stitches create a textured pattern with the use of increases and decreases for a wavelike effect. US 5 DPNs (a circular needle for the magic loop technique may also be used). 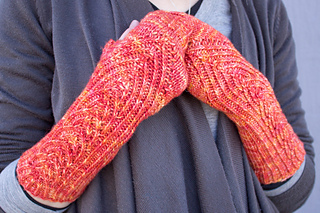 Blocked measurements: About 10” in length and about 8” in circumference for each glove. 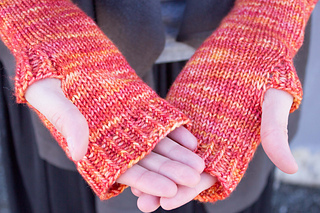 This pattern has instructions to accommodate DPN’s or magic loop technique. This pattern uses less than a skein of Tosh Sport, so you will have plenty of yardage for more repeat sections if you wish.